After the season of his life in 2015, Danny Willett maintained momentum with his stellar victory at last week's Dubai Desert Classic. It was a success that suggests even greater honours lie in prospect for the Englishman. All wins are good, but this was special. The 28-year-old from Sheffield showed commendable nerve and skill to hold off compatriot Andy Sullivan to complete victory by the narrowest of margins. Both players made single-putt birdies at the last as they strove for victory, which surely indicates they have the mentality to succeed at the very highest level. With the stunning strides taken by 21-year-old Matthew Fitzpatrick - another Yorkshireman - and the continued progress of Chris Wood, the future of English golf looks increasingly bright. This crop of players look equipped to take over from the generation that spawned world number ones Lee Westwood and Luke Donald, as well as Paul Casey and Ian Poulter. "I think we are kind of going through that transition now," said Willett. "And I think the likes of me and the other young British lads are just going to keep progressing. "I can see it being very competitive for the next few years." A virtuous circle is developing that inspires this new generation, many of whom first came together playing amateur events and as team-mates in the Home Internationals. "It was pretty strong teams from all the countries," Willett said. "And I think the England lads are kind of just feeding off each other. "You look at the likes of Sully and Woody and myself, and Fitzy in the EurAsia Cup - it was good fun to be in and around it, having a good craic and a good bit of banter. "I think for the next few years we're going to be the ones that are trying to beat each other." Of the older guard, 35-year-old Justin Rose is seventh in the world and Casey remains in the top 30, with the 38-year-old's form last year suggesting he could head back towards the top 10. Willett is already moving in that direction. His Dubai triumph was his third in the past 13 months, and he has had nine other top-six finishes. He has risen to 13th in the rankings, an ascent down to growing maturity allied to the immense talent that's been there all along. "Winning and losing, there's such a minuscule difference between it," Willett said after his latest victory. "It's just about putting yourself in that position as many times as possible. Some days you get lucky." Willett's primary objective every week is to contend. "In my mind, that's a victory," he said. That was the attitude that helped him push Rory McIlroy all the way to the final week of last year's Race to Dubai. The early evidence suggests a similar duel might emerge in 2016. 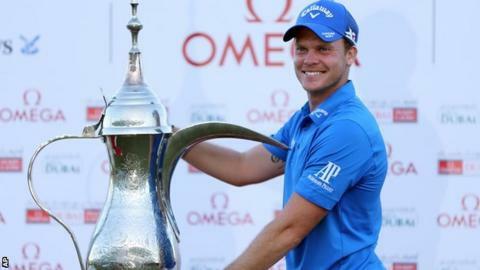 Willett's victory at the weekend eased the pressure on another season based on the European Tour. He has banked valuable Ryder Cup points and remains firmly on target to represent Great Britain at the Olympics. Before then, he is due to become a father for the first time. His wife Nicole is expected to give birth in the run-up to the year's first major, the Masters at Augusta. "It's nice to know that the stuff I'm doing is working - and my schedule choice," he said. "It's nice to get off to a quick start because it's going to give me some key time off with Nicki's birth, and obviously we're going to be well up there in the world rankings for Rio and for the Ryder Cup." Next stop is Malaysia later this month, before the year's first World Golf Championships tournament at Doral, where he finished third last year. As for Sullivan, it is extraordinary to think back 12 months to his wide-eyed disbelief at being put in the marquee McIlroy group for the first two rounds of the Dubai Desert Classic. This likeable, ever-smiling Midlander has become a fixture for such billing at European Tour events. Now he will try his hand in America, and if he can tame the driving demons that crept in last week he will challenge for big prizes. His putting touch and nerve on the greens make him a very dangerous prospect. Expect him to continue to climb from 28th in the world rankings. "Bodes well for the rest of the year," he smiled after his share of second place in Dubai. He is absolutely right - not just about his own prospects but for those of British golf.